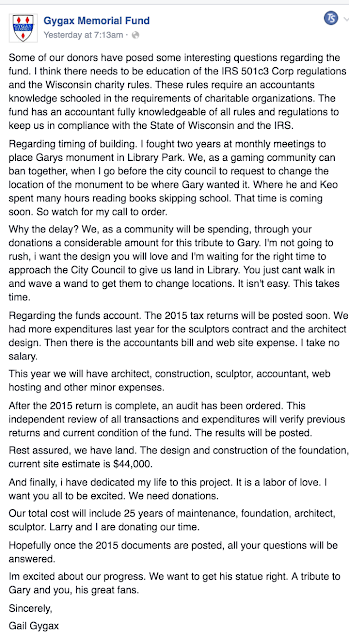 Tenkar's Tavern: I Never Realized the Gygax Memorial Fund has a Facebook Page and it was Updated! 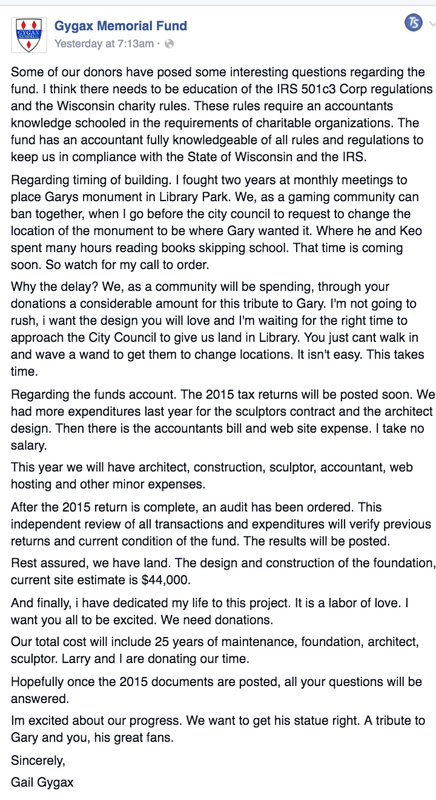 The interesting bit is "I am waiting for the right time to approach City Council to give us land in Library..."
then further down, "Rest assured, we have land." Hmm, so which one is it? Can't seem to find the like button. Doubletalk and stalling tactics. For one thing, if you need a city council to approve a location, you make that request as early as possible as governments take forever to do anything. Problem I don't see mentioned very often, while Gail was given a spot for the statue it's not the spot she wanted, and the Council has not been receptive to the location Gail wants. Thus, the statue is nowhere close to being ready to go until this location is set.